Our team of professionals has over 70 years of experience in printing, design, bindery and customer service. We can save you money and time by sending your print jobs to your mailing list. Started in a basement in 1976 with a strong commitment to service and excellence, Graphic North, Inc. has become Fairbanks’ premier printing company. 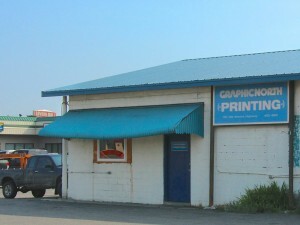 Located in the Golden Heart of Alaska and boasting a staff with more than 70 years of experience, it continues to build on its solid reputation, commitment to quality and excellence for both large and small printing projects. Whether you need 25,000 full color brochures, or 100 business cards, Graphic North can meet your printing needs. We are a full-service printing company, offering offset, digital, and large format printing services. We can assist in designing and preparing your projects for print and choose the processes that best meet your needs. We also provide bindery services, and we can bulk mail your finished project to customers. Graphic North is located at 157 Old Steese Highway in Fairbanks, Alaska. We are right across the street from Play it Again Sports and Taco King. Look for the blue roof.